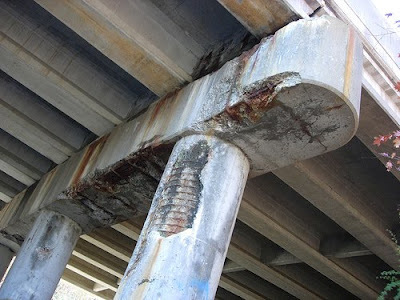 America's infrastructure received a D grade point average from The American Society of Civil Engineers last year and needs a 5-year investment of $2.2 trillion to move up to a B grade. Government spending statistics point to years of neglect and misplaced funding priorities. According to the website usgovernmentspending.com, in fiscal year 2010 total federal spending on transportation is $106.5 billion and other spending including energy and water supply is $109 billion for a total of $215.5 billion. Compare this to the $895 billion in defense spending and a dire picture is painted. While we are spending billions in taxpayer money building roads, bridges, power lines and water pipes in Iraq and Afghanistan, here on the home front our outdated 20th century infrastructure is literally crumbling before our eyes. The History Channel recently aired a disturbing documentary called "The Crumbling of America" about how desperately we need to upgrade our roads, bridges, power grid, sewage and water systems or improving our rapidly decaying infrastructure will cost much more than $2.2 trillion down the line. Here is a preview of the 2-hour special airing on The History Channel.